Wow, this is incredibly eye-opening. Such dishonesty in reporting/campaigning ads. I did find it very hard to believe that video footage of Trump. This does put a different light on it entirely. It is so wonderful being able to find the the truth than accepting “agenda” lies. Thank you Ann Coulter. 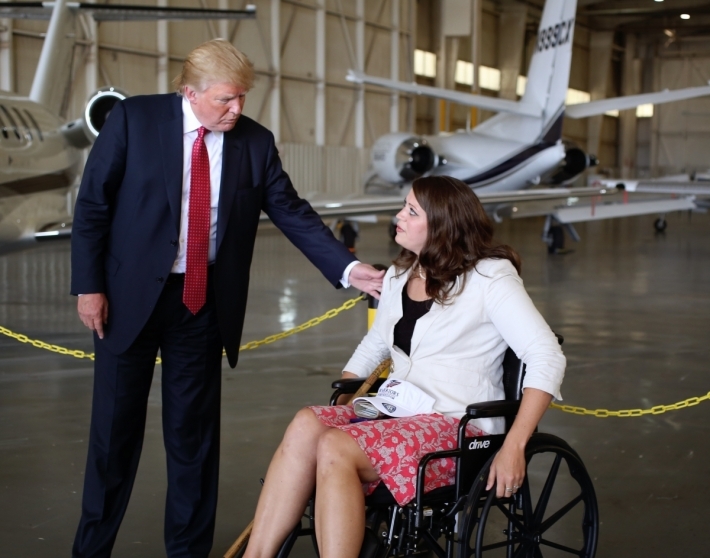 Trump said right after “I don’t remember ever meeting that reporter, I would never mock a disabled person”. We all knew he didn’t do that. Now lets talk about what the reporter did; He claimed in an article after 9/11 that Muslims were celebrating in the street, because they were we all remember that. However after Trump said it this reporter recanted his story from 15 years earlier to hurt Trump and continue the narrative that Trump lied. The reporter, handicapped or not, is a dishonest jerk. There is also a Clip where Trump explains that he wasnt even aware the reporter was handicap. He had meet him years ago very briefly but had no idea who he was. Trump does meet a LOT of people. I am sure we can understand how the reporter remembers meeting him but Trump doesnt remember the reporter. That is in the original article. Look at the related links on the bottom. Exactly. Where I work, I see a lot of people every day. There are some people who have been coming there for the 3 years I have been there, and I still ask them their name and which company they are with. And the truth shall set you free (but continue to burden the liberal media). THE CLARIFICATION OF THE CLINTON AD MOCKING THE HANDICAPPED REPORTER HAS TO BE SHOWN NATIONWIDE.I AM A STRONG TRUMP SUPPORTER AND EVEN I WAS EXTREMELY BOTHERED BY THIS AD ALONG WITH MANY OTHER PEOPLE I KNOW. MY SISTER WAS BORN TOTALLY HANDICAPPED AND I COULD NEVER ACCEPT ANYONE WHO MADE FUN OF HER OR ANYONE SO AFFLICTED.HOWEVER- SOME IDIOTS WOULD AND IT HURT HER TERRIBLY.SO- I WAS VERY HAPPY AND RELIEVED TO WITNESS THE CLARIFICATION.GO TRUMP. Thank you for your good reporting! Good job folks. I did a video time line of your research for Constitution.com. Of course, I gave Catholics4Trump.com credit throughout. We can no longer BELIEVE the Media to give us FAIR, HONEST and OBJECTIVE REPORTING!!!! I read and watch numerous Websites and Alternate Media Outlets in order to insure that I get a realistic and honest view of Politics and Current Events. When I took Journalism 101 in College in the early ’70’s the rule of thumb was to objectively report a story. And to leave my opinion out. Unless I was writing an op-ed column. Those days appear to be dead and gone. God only knows what College Students today are being INDOCTRINATED with. No. The only one who can say for certain whether he mocked a reporter’s disability is Trump and he says he did not. This also corresponds to the evidence since Kovaleski does not have a disability Trump imitated an Trump does this impression for flustered people in general. Because Trump would never lie, never, and thus we should all naturally believe him. A counter commercial should be made with this to discredit the media. I’ve seen Trump do this impression during his campaign and I always thought to myself “Hey! that’s the same impression the media says is about mocking a person with disability!” I am glad people actually took the time to show that is just something he does and has nothing to do with targeting a person with disability or to mock a disability. When I think of myself, I sometimes do certain gestures when I joke about someone, I never intended to mock people with disabilities, do you? I have to vote for Trump simply because there is no other choice. I guess that in some sense the need to vote for Trump is to support Trump. But, I don’t see how all these comments can express near excitement at the fact that Trump has been discovered displaying a childish and mean pattern of mocking people with his spastic movements. I guess it’s better to mock someone in general, simply because you have no better way of responding, than to mock someone’s disability. Do we want to sink to the level of the liberal media? Good but you should have cited to our more in depth article on the topic. I understand it is VERY difficult…….. Jesus never suggested it would be easy. Following Him is among the hardest things you will ever do, but also the very most rewarding. What I am driving around the block to say is this – it is surprising to me the number of Christians who jump ship at the first sign of trouble, or who slam a person post-haste once they find out the person is imperfect. Jesus – our Christ – is about finding God, even if it’s later rather than sooner (sooner being preferred, of course!). He was about redemption, about acknowledging our sins, asking to be forgiven, and promising God and yourself that you WILL do your level best to do better. The Good News (I personally view as GREAT News – the BEST) – is that we CAN be saved, we CAN ask to be forgiven, that it is known we DO sin, but it’s what we do about it that counts. But too many say “he’s a sinner, he’s a horrible person, how can any Christian person support such a person”. How can any Christian person judge with such finality? I have worked with, and around, and lived with people who DO have handicaps. I married a woman with a handicap. My oldest son had trouble walking flat on his feet (he walked on tip-toes) and waved his arms around a lot when it was younger. The former was corrected with surgery, the latter seemed to disappear with age. The cause? Mild Cerebral Palsy. The doc said “momentary lack of oxygen during birth”. No other issues, smart as all get out, high IQ, an over-achiever. I worked with people who had suffered brain injuries through sports, accidents, etc. And in recent years, helping people with disabilities, handicaps, find meaningful employment, and if needed, education required to secure same. I’ve seen so very much – I know these people. I have lived and worked with them – so I believe I speak with even 4% authority when I say that I never did believe Mr. Trump was actually mocking that specific person. Multiple reasons – the fellow didn’t flail his arms, in fact, his problem is they are locked in position and will not, do not move like “normal” or someone with CP or autism. So how can flailing of arms and the sort of animated movements Mr. Trump be seen as mocking a person who doesn’t even have that problem?? It would be like mocking a tall person by pretending to be over-weight. His actions don’t even come close to the journalist’s own problems. Next, “mocks the disabled”. Uh, if he HAD, then it would be accurate to say he MOCKED, not MOCKS. It would have been a ONE-TIME thing, mocking ONE person, not mocks, and not “the disabled” as in many or several. One case, one example, one person. Is that “he mocks the disabled” ? And then the most recent ad playing in Iowa shows a mother of a child, sorry, I have to switch channels as I HATE that ad, and I believe the child has autism? Is that correct? OK, so THAT child, or perhaps children and/or others with autism have a problem as far as arm movements. Trump never saw that child, his speech was not in reference to a person with autism, and was not generalized – he was speaking about a specific person, who just happened to have a disability, but it was not directed at the disability, or people in general. And as you wisely show, Mr. Trump is ANIMATED. I will tell you a dirty little secret – so am I! I have severe ADHD. Can’t sit still, move arms and legs a LOT. SOME people with ADHD, depending on the severity and sort they have, may move their arms a lot when speaking. Anyone else notice he can’t keep his hands still while speaking? I used to work with Russian people – in a company run by Russians, and I can tell you this – they are very animated when discussing things, and LOUD. When I first started I’d walk by one of the VP offices – door closed and LOUD voices, and I saw arms moving a lot one day – and I asked one of the other staff – is this a problem – uh, do we need help? No, and they laughed, that’s just a couple of the VPs having a discussion. I asked – do you mean argument? Nope – that’s normal when they get a bit excited or want to make a point, arms, hands- lots of movement, and very loud speaking voices. It sounded like a fight, but it was not. things were fine. So what Trump was doing, as you showed us, was normal for him when “animated” or excitedly making a point. And the handicap, or disability? Not even the same. And how could Trump in that speech have been making fun of a child with autism when the child wasn’t there, and Trump was talking of an adult reporter, who he likely forget even had any issues! Did Trump really mock reporter's disability? Videos could back him up – Hi News – The News You Want!